current page What difference can MS specialist services make for people affected by MS? MS Awareness Week begins next week on Monday 27 April. This year we are working to highlight the importance of MS services – the MS nurses, physiotherapists, occupational therapists and other health professionals with specialist expertise in MS. But what exactly does a good MS service look like, and what difference can it make for people affected by MS? To find out we visited the Rehabilitation Unit in Richmond, southwest London. We spent a day with the MS nurses, physiotherapists, occupational therapists and other professionals who work as part of a multidisciplinary team, making sure people living with MS get a properly holistic service, across the range of symptoms that are part of MS. In just one day we saw many examples of the profound impact that these professionals have. In the morning we travelled with the MS specialist nurse Francesca on a home visit to Shirley, a woman living with progressive MS. Shirley told us how much she appreciated the service at Richmond, the fact that she had a single contact she could turn to for advice and information in managing her MS. In the past when she dealt with a different service she would often speak to a different person every time she called, and she felt this meant she often had to explain her situation from scratch and didn’t get any continuity of service. She really appreciated the home visits as now that she’s less mobile it wasn’t always possible to visit the clinic. While were in the Rehab Unit’s gym we were invited to take part in a balance class for people with MS. It was great to watch the physio team lead the class in a range of simple exercises that can make big difference in staying active and avoiding falls. One of the women who took part in the balance class was Jane. As soon as the balance class was over she was able to walk straight into a meeting with her speech and language therapist, Cate. As an actor, speaking clearly is very important for Jane, but she recently found her MS was causing her to speak too quickly. 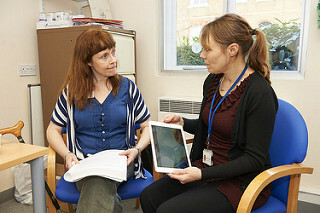 With the help of an iPad, Cate was able to record Jane reading a few paragraphs of text and then play the recording back so that she could identify what was causing particular problems. Seeing Jane going from the balance class to the speech and language therapist was a great advert for a “joined-up”multidisciplinary MS service. 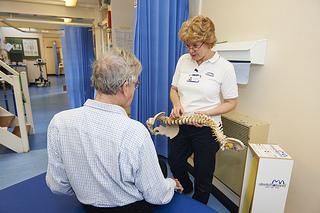 The whole team share an office, and the MS nurses told us how good it was to be able to book a physiotherapy session for someone with MS with a physiotherapist who was on the other side of the desk rather than in a different department of an NHS Trust. In the afternoon we sat in briefly on a consultation between Nasreen and her MS specialist nurse, Ruth. Nasreen told us how traumatic she had found being diagnosed with MS. At first she couldn’t even bring herself to say the words “multiple sclerosis”, and found herself becoming more and more isolated. Her son was scared that his mum had cancer, he was so worried about her. Nasreen told us how accessing the service at Richmond, meeting her MS nurse, and going on a fatigue management course had turned her life around. 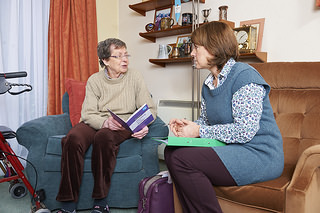 Not only did it help her practically manage her energy levels, it played a major part in helping her accept her condition, talk more openly about it with her family and improve her overall wellbeing. 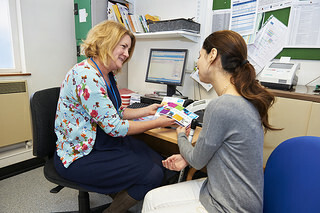 It’s hearing stories like this that make you realise just how important MS specialists can be – not just by helping people manage particular symptoms, or find specific treatments, but looking at the whole person and helping them live well with MS.
We know that some people don’t yet have access to a team like the one at Richmond. That’s why we’re running our Heart of MS Care campaign this year. We’ve seen the difference that MS specialists can make, and want to make sure that more people can benefit from their expertise. If you’d like to help, then add your voice to our campaign and help us spread the word. You can also help us to train MS specialist nurses and therapists by making a donation to our latest appeal. Together we can make sure everyone affected by MS can access the best possible care. NB: The names of the people with MS in this article have been changed.